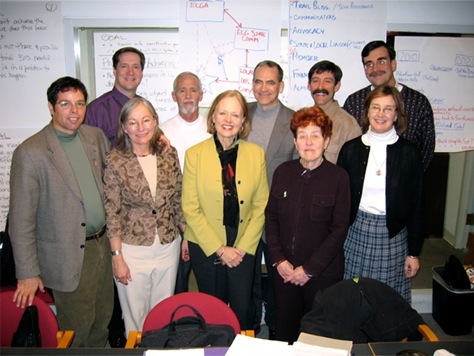 Chuck Flink, back row far left, led a 2004 strategic planning session for the reorganization of the East Coast Greenway Alliance. State Coordinator, North Carolina, 1999 to 2002, East Coast Greenway, America's 3000-mile Urban Greenway from Maine to Florida. Volunteer Designer, Grand Canyon Greenway, January 1997 to April 1999, member of volunteer design group that planned 72-mile greenway system for the North and South Rim's of the Grand Canyon National Park. Volunteer and Consultant, Chattahoochee Riverway Project, Atlanta, GA, August 1997 through October 1998, member of a volunteer design group that proposed solutions for 23 miles of the Chattahoochee River in Atlanta, GA.
State Coordinator, North Carolina, 1993 and 1994 National Trails Day, America’s nationwide celebration of trails and greenways. Participant, National Trails Coalition Lobby Week, United States Congress, Washington, DC 1989. Made presentations to members of Congress regarding the need for improved trail resources on Federal lands.